Nine years after he made his Broadway debut with the wisecracking Come Blow Your Horn, long after he was proclaimed the commercial theater’s reigning king of comedy, Neil Simon made a drastic tonal shift with the darkly dramatic The Gingerbread Lady. This tale of an alcoholic nymphomaniac and her emotionally needy friends did have glimmers of the serious Simon of his later career, but in 1970, audiences had no idea what to make of this mawkish pity fest and it closed after a mere five months. Curiously, Boca Raton’s Primal Forces, a company that usually traffics in edgy and esoteric fare, has revived The Gingerbread Lady in an attempt to examine this underappreciated work of Simon, who passed away nearly seven months ago. It is easy to see why this remains one of his least-produced plays, where the most likeable character is also the most minor, a Hispanic grocery delivery boy. The play revolves around a former saloon singer, alcoholic nymphomaniac Evy Meara (Patti Gardner), newly discharged from a rehab sanitarium where she not only dried out, but lost 50 pounds. 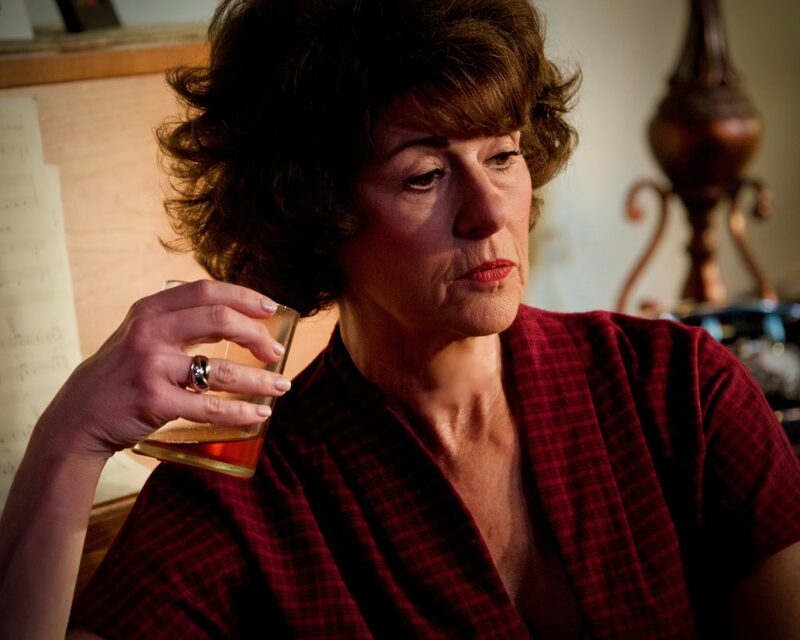 Still, her friends – an aging gay unemployed actor (Jeffrey Bruce) and an obsessively vain neighbor (Janice Hamilton) – are worried that Evy will soon return to drinking. Well, they voice concerns, but are too wrapped up in their own problems to truly care about Evy’s dilemma. That leaves Evy’s 17-year-old daughter Polly (Gaby Tortoledo), the play’s most mature character, who is ready to put her life on hold and move in with her mother to take on the parental role and scold Evy into remaining sober. And there’s a no-goodnik folk singer named Lou (Seth Trucks), who lived with Evy for six months, then walked out on her, sending her into an alcoholic bender in the first place. As you can imagine, all of this comes off as soap opera, leavened by Simon’s one-liner gag reflex. Wisely, director Genie Croft downplays the comedy, but what remains is extremely maudlin. It is hardly a spoiler to reveal that Evy will fall off the wagon with a boozy tirade in the second act or that Simon will then wrap things up with a glimmer of hope that is not particularly earned or convincing. The saving grace of the Primal Forces production is Gardner, a natural empathy magnet who manages to deliver much of Evy’s bitter dialogue with an underlying warmth. When she relapses and begins drinking again, we care for the character, even if her descent seems dramaturgically inevitable. Both Bruce and Hamilton are shackled with roles that are largely caricatures and neither of them does much to counteract the exaggeration in the writing. Tortoledo is a recent graduate of Florida Atlantic University’s drama program and acquits herself well enough in this early professional assignment. Looking back on Simon’s career, it is possible to see The Gingerbread Lady as a precursor of better, more tragi-comically balanced plays of his, such as Chapter Two, Lost in Yonkers and the bookends of his Brighton Beach trilogy. So if you are doing research into the arc of Simon’s career, you will want to take a look at The Gingerbread Lady. If, however, you are in search of an evening’s entertainment, the current offering at Primal Forces comes up short. THE GINGERBREAD LADY, Primal Forces at Sol Theatre, 3333 N. Federal Highway, Boca Raton. Through Sunday, April 14. $30, with $5 extra for front row seats, 866-811-4111.